... transversal nature of this collection makes it perfect for both the world of interior design as well as for the exterior cladding of buildings. ... perfect product for particularly high-traffic public and commercial areas, for both interiors and exteriors and for ventilated facades. A ventilated facade (ventilated cladding or rainscreen) is a non load-bearing facing attached to the structural elements of a building to protect it from the rain and other weather phenomena. It allows air to circulate between the facade and the structure, improving the acoustic and thermal insulation. On ArchiExpo, these facades are arranged by properties such as material or extra features (such as anti-pollution qualities). These facades are suitable for both new and existing buildings to improve thermal and acoustic conditions, and facilitating the release of water vapor. They also add interest to the exterior finish. 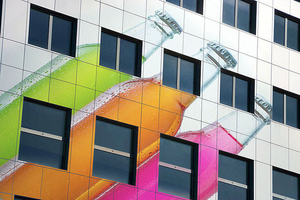 Glass, printable ceramic, copper, stone, concrete or even wood and other materials are used to create such facades. Determine fastening system and its suitability for the underlying structure. Consider facade impact on building appearance. It should comply with applicable building codes and be suitable for the surroundings. Verify finish durability and the terms of any guarantees or warranties. Other factors include sturdiness, insulating properties and ease of maintenance, repair and replacement.